Imagining a world full of peace, harmony, and steam model manufacturers who put Kadee coupler pockets on the front of their locomotives! Click on the above to visit our featured advertisers. Tell them you saw their ad on Wiring for DCC! Have a DCC product to sell? Advertise here. Wiring For DCC. How to wire your model railroad for Digital Command Control. This is what this web site is all about! Ask your question on the DCC Q&A Forum.Check out the very popular section on Turnouts. Don't know where to start? Try the DCC for Beginners section. To get a CD-ROM of this website, click here. 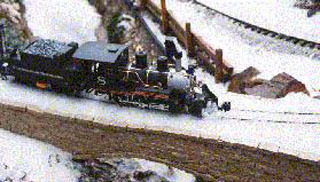 Introducing my interpretation of the coal carrying Clinchfield Railroad occupying the ENTIRE second floor of my house! 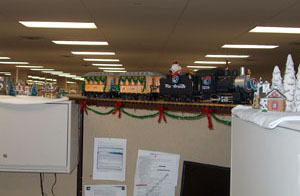 Put a train around your office cubicle! 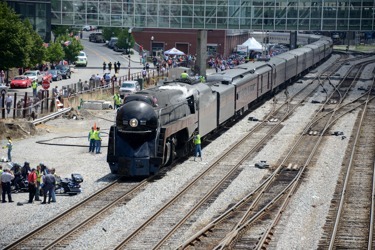 N&W #611 is back under her own power! No diesel pusher for this magnificent engine. About 5,000 people turn out for a ride over the 4th of July weekend. Hundreds line the tracks and highways to get their photos. For more on N&W #611, click here. The Great, Scenic Clinchfield Railroad - the inspiration for the HO railroad. The Clinchfield was the best engineered railroad of its time. Thank you for the encouraging e-mail. It helps justify to my wife the amount of time I spend on this page! Content Description: "Allan Gartner's Wiring for Digital Command Control Home Page for model trains. 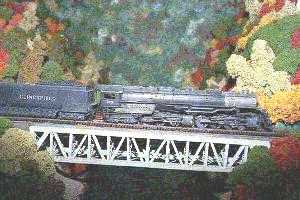 Includes his garden railway and HO layouts with other train related links." Keywords: "wire, wiring, DCC, Digital Command Control, train, model railroad, Digitrax, NCE North Coast Engineer, MRC, Lenz, Railroad &amp; Co., Zimo, MRC, Atlas, KAM"
Copyright by Allan Gartner 1996 - 2017 © All rights reserved. You may print this for your own, personal, non-commercial use. Non-commercial, nonpersonal reproduction may be requested by visiting www.WiringForDCC.com/writeme.htm. 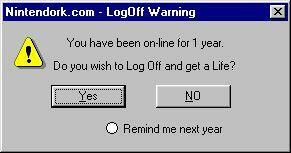 All users, commercial and non-commercial, may link only to this site at www.WiringForDCC.com. Thanks to all who contribute to this site and the Q&A forum!